Which ship has the Ugliest Sweater? Which ship has the best ugly holiday sweater? 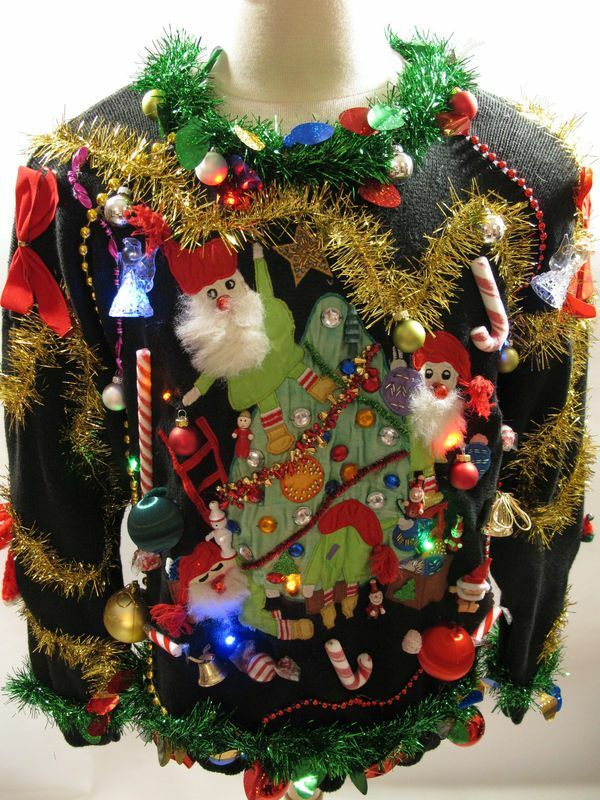 It's that time of year again... ugly holiday sweater season. So... Who has the best ugly sweater? I actually unironically like the Torch's paint job here. That actually looks good. Reminds me if someone tried to make digicam sporty. Do you has? Do you?! Good choice using the Torch for Hanukkah. It is nicely Menorah shaped! Does no one else SEE the Shaman?! It is transcendentally green! It's so green that I just called it transcendentally green and I don't even know what that means! It is so green that it is #00GG00. It is so green that even when you turn off the game, it's still green. It is so green that even if it were moving towards or away from me nearing the speed of light it would still appear green. It's so green, it's used as the standard for green screens for movie studios sfx! I think the panzer is differently wearing the worst. The others just have color schemes with bright colors, but that texture of the trees on the panzer going in different directions reminds me of my last attempt at texturing something. Horrible. It should retire like I did. The Torch actually looks good! That is not ugly at all. So of the eight actually ugly sweaters, the Typhoon dives head first into ugliness with a very garish color scheme and is my second place choice. First place in the ugly sweater contest has to be the Panzer; he's not wearing a sweater, he is wearing wrapping paper! Seriously, I have a roll of that pattern in my closet right now! totally agreed on the Panzer. It's not about the colors, it's about the pattern. It's busy, badly aligned, and has too many different orientations relative to itself which is normally an advantage in 6dof but not for texturing. That's actually why I kinda like the Panzer, in a semi-ironic way... It looks like your average giftwrapping job! Also, the Predator appears to have just been left out in the rain too long. No love for the poor Wasp? Just love, Dunkelza. Just love. Sinterklaas is the basis for the North American figure of Santa Claus. reinvented their Sinterklaas tradition, as Saint Nicholas was a symbol of the city's non-English past. In the 1770s the New York Gazetteer noted that the feast day of "St. a Claus" was celebrated "by the descendants of the ancient Dutch families, with their usual festivities." In a study of the "children's books, periodicals and journals" of New Amsterdam, the scholar Charles Jones did not find references to Saint Nicholas or Sinterklaas. Not all scholars agree with Jones' findings, which he reiterated in a book in 1978. Howard G. Hageman, of New Brunswick Theological Seminary, maintains that the tradition of celebrating Sinterklaas in New York existed in the early settlement of the Hudson Valley. He agrees that "there can be no question that by the time the revival of St. Nicholas came with Washington Irving, the traditional New Netherlands observance had completely disappeared." However, Irving's stories prominently featured legends of the early Dutch settlers, so while the traditional practice may have died out, Irving's St. Nicholas may have been a revival of that dormant Dutch strand of folklore. In his 1812 revisions to A History of New York, Irving inserted a dream sequence featuring St. Nicholas soaring over treetops in a flying wagon – a creation others would later dress up as Santa Claus." The sweaters are about to get packed away, so be sure to vote SOON! Goliath's sweater is awful, so that should be a sure winner!